Is SafcLotto a Scam or Legit? Read Reviews! 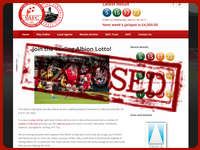 Stirling Albion Lotto is one of those charming little homegrown games. It’s operated to fundraise for the Stirling Albion Football Club, in particular, the Youth program. You are not going to win any of those mega jackpots at safeclotto.co.uk at the same time for £1 a play (ticket line) you can get in on the fun. It doesn’t get much more straightforward than this. Players pick four numbers between 1 and 40 per ticket line. The draw takes place once a week on Wednesday at 13:00 GMT. Ticket lines can be purchased in person, with a reoccurring form or online. There is a small charge for direct bank debits. Otherwise, they use Master Card & Visa for the face value of their lottery tickets. The jackpot starts at £1,000 and grows each week by £250 until it is won up to a maximum of £20,000. Jackpot winners must pick all four numbers correctly. Three numbers pay out £250. Multiple winners divide/share any of the prize levels. Winners will be notified by snail mail, published in the local newspaper, at outlets and online at both the stirlingalbionfc.co.uk and safclotto.co.uk website. Players have two months to claim their prize, or it’s put back into the Trust and local charities 50/50 split. The Stirling Albion Supporters Trust was registered in 2002 as an independent society to build support between the football club, community, and fans. The football club went through a heap of downs financially, and supporters became more and more concerned about how it was being managed. In 2010, The Trust bought the Stirling Albion Football Club. This was the first time a senior league club in the UK became owned by the fans. The club is supported by membership subscriptions, advertising and other charity drives including their lottery. Getting in touch with the team that runs this lottery is pretty easy including the fact that they post the name of the guy who heads it up and his phone number. There are also a snail mail and email address, and online form. There are no complaints, but then again seriously, this is about as straightforward as it gets – pick four numbers and win (or try to). It appears that anyone can play as long as you aren’t bound by the laws where you are. Oh, you do have to be 16 or older. Would you mind rating SafcLotto.co.uk ? You are certainly not going to become a millionaire from this jackpot at the same time it’s cute and easy to play. A legit group runs it and monitored by the UK Gambling Commission. If you are an Albion Football Club supporter, then I am sure you are already playing! If you are not, then for £1 a ticket line, this could be a giggle. If you are an Arsenal Football Club supporter, check out this review. This private lottery gets a thumbs up for being so straightforward at the same time I think I’m going to stick to US Powerball and Canada’s 6/49. I’m still planning on that mega jackpot win. Though as a sports person, I wanted to give this a higher review but as a serious lottery player, I couldn’t do it. It’s looks like good fun and nice to see a club figuring out how to raise more funds to for their support. It’s not a lot of money for a ticket and you know it’s doing good. I will still be playing some of those mega international jackpots also!